If L = [ ], then perms(L) would be [ [ ] ]. If L = [1, 2, 3], the result of perms(L) will be an array [ [1, 2, 3], [1, 3, 2], [2, 1, 3], [2, 3, 1], [3, 1, 2], [3, 2, 1]]. Note: the arrary could be any order. The exact statement that I want to prove to you is: for any given array L of size n, the perms(L) is an array of all size-n permutation of L.
First, basis step: Let L = [ ]. The L.size will be 0. Then the perms(L) will return immediately with value [ [ ] ], which is the array of all size-0 permutation of L.
Inductive step: Let assume statement is true for any array with size n. We have to show that for any array L of size n+1, perms(L) will return an array of all size-(n+1) permutation of L.
Since L have size n+1, the perms won't return immediately and the result is set to an empty array [ ]. In the loop start at line 4: we create an array L1 for each element elm of L by subtract [elm] from L. The new array L1 have size n, and contain all other element of L, except the elm. By assumption, perms(L1) is an array contain all size-n permutation of L1. Some may argue that this is not really mathematical induction, it's more like induction reasoning. 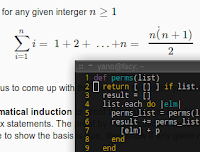 I say, the important is the basic principal is the same, prove basis case, then show the induction step. Moreover, if you look at the induction proof in graph theory books, or algorithm books, you probably see some thing similar to this. Hopefully you find this post is interesting and help you to understand more proof that using mathematical induction. Some time it's doesn't clearly stage which part is basis step, which part is induction step, but it's all there, otherwise the proof is not complete.